The jeweler determines the ring’s current size using a ring sizing tool called the mandrel.The mandrel tells the jeweler how large a piece of metal to cut from the ring’s shank, to achieve the customer’s finger size. Using a fine saw blade, the jeweler cuts through the shank to remove the cutout piece. See Figure 1. Figure 1 – Removed gold piece to size down. The jeweler forms the ring shank to the new smaller ring size. The jeweler laser welds to fill the adjoining seams. The resized ring will not show any sign of a soldered seam. Finally, the jeweler polishes any remaining tool marks. See Figure 2. Figure 2 – The ring before sizing (left, size 7), and after sizing (right, size 5) using the cut & weld sizing method. 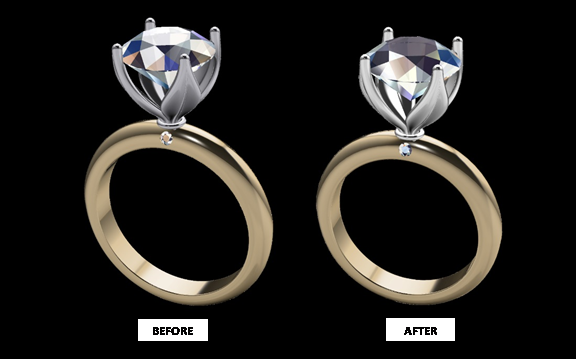 The resized ring maintains its original look. The resized ring maintains its original comfort fit. Faster and cheaper resizing fee. Excessive resizing of the ring can reduce the overall structural integrity of the ring shank over time. The customer cannot adjust the ring at home after sizing while the spring sizing method can allow some adjustment. This method does not help to stabilize the ring to the upright position on the finger. Some customers with a large finger knuckle experience their ring rotating from its upright position, even when the ring is sized correctly to the customer’s preferred ring size. An alternative (non-destructive) sizing method is to laser weld a custom spring bar inside the shank. 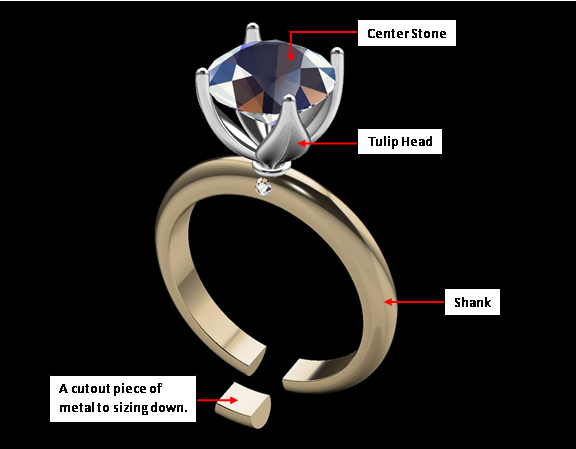 This method enables the jeweler to size the ring down without cutting out any metal from the original shank, see Figure 3. 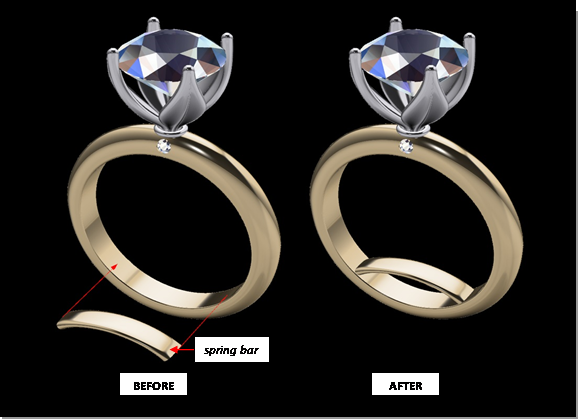 Figure 3 - The ring before sizing (left, size 7), and after sizing (right, size 5) using the custom spring bar sizing method. It works best for clients with a large finger knuckle. The tension of the spring bar against the bottom of the finger minimizes ring rotation and keeps the center stone upright. The customer can adjust the ring based on their fitting preference or seasonal swelling.